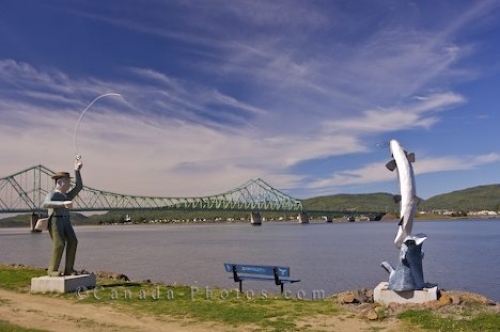 A fisherman and an Atlantic Salmon statue displayed along the river bank in Restigouche, New Brunswick with the J.C. Van Horne Bridge as a backdrop. Fishing for Atlantic Salmon is spectacular in the Restigouche River in New Brunswick, Canada and a statue of a fisherman and a salmon beautify the banks of the river. In the background, the J.C. Van Horne Bridge crosses over the river under the wispy clouds that sweep across the New Brunswick sky. Fisherman and atlantic salmon statue along the banks of the Restigouche River, backdropped by The J.C. Van Horne Bridge in the town of Campbellton, Appalachian Range Route, Highway 11, Restigouche, New Brunswick, Canada. Picture of a statue of a fisherman fishing for an Atlantic Salmon beside the Restigouche River in New Brunswick.